Goodbye, hundreds of dollars of precious plastic! Welp, perhaps it was inevitable. Many gamers get angry about changes to games they love, but YouTuber Death, Holy Death has taken that rage to an extreme in protest of the cancellation of Warhammer Fantasy Battle and its subsequent replacement with the rebooted game Warhammer Age of Sigmar. See, Age of Sigmar has significantly different rules from its predecessor - some of which are admittedly a bit silly. This man is, perhaps understandably, furious about the changes. 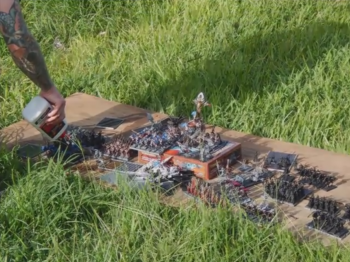 To that end he has burned his Warhammer army to a raucous death metal track, a collection that, eyeballing it, was likely worth upwards of $900 USD at retail price. Not counting the hours spent assembling and painting those miniatures which were assembled and painted. In his pre-pyre rant, Death, Holy Death admits that he's not taking the changes well, unleashing a litany of angry insults against game publisher Games Workshop for creating the game instead of a new edition of Warhammer Fantasy Battle. He also takes the time to briefly outline his issues with the new rules. I don't particularly recommend the rant - it's profanity laden, offensive, and not safe for work. Curious about the rules that could inspire such fury? We've highlighted a few of the silliest new rules we could find here.